One of the advantages of being an international manager is being spared the stress of transfer window deadline day. But it doesn’t always work out like that. Gordon Strachan, who turns 60 next Thursday, could have done without the anxiety earlier this week over two members of his starting XI against England in Scotland’s last competitive game. With hours to go before the transfer window shut, Craig Gordon, described by Strachan as Scotland’s “in-form goalie at the moment”, was pondering the chance of a lifetime offer to join Chelsea, the only downside of which was potentially limited opportunities to play. At the same time another Celtic player was in the news, though not because there was interest in him from elsewhere. Leigh Griffiths is in danger of becoming the forgotten man in Celtic’s potentially historic season. Manager Brendan Rodgers chose deadline day to create headlines by questioning the striker’s approach to being a professional footballer. The last time Strachan saw Griffiths was at a Kevin Bridges gig, which perhaps says it all. The 26-year-old striker’s apparent arrival at another career crossroads isn’t a laughing matter, however. Griffiths wasn’t included in the squad for Celtic’s 1-0 win over Aberdeen on Wednesday night after picking up a calf injury that Rodgers attributed to the player’s attitude to training and current lifestyle. He has only scored five times since a purple patch at the start of the season after scoring over 40 goals in the last campaign. Griffiths has still to score for Scotland but started the 3-0 defeat by England at Wembley in November. According to Strachan, the only headaches Griffiths causes in and around the Scotland camp are those the player suffers from himself. But the manager hasn’t always sounded convinced by Griffiths, whose international career has been stop-start. “You never pry into what’s going on at a club, you never say, ‘what’s happened to my player’,” said Strachan, on a visit to Edinburgh to hand memorabilia from his career to the Spartans Community Football Academy, where he is a patron. It was inevitable talk would soon turn to Griffiths who, as well as being in the headlines earlier this week, hails from the same north Edinburgh streets as Strachan. The Scotland manager stressed that Rodgers had the right to motivate Griffiths whichever way he feels is best. But Strachan issued a general warning to players who struggle to make the best of themselves due to extracurricular issues. Either commit yourself totally to football or don’t bother. 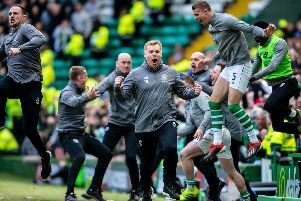 It isn’t hard to note the contrast between Griffiths and Gordon, who has overcome numerous setbacks to get back to the position of being wanted by the leaders of the English Premier League. Former Chelsea midfielder Frank Lampard’s retirement yesterday after a long, trophy-laden career is more evidence of how hard work pays off in the end. Strachan hopes that Griffiths takes Rodgers’ concerns on board. “In general he comes and I find him decent to work with,” added Strachan. “When he trains he trains hard. He’s decent to work with, he always has a nice sense of humour about him. He’s never caused me any bother. I don’t have to work with him every day. I played him in the last game. When I am the international manager I can only ask [for more],” he added. “If you are paying people at your club a lot of money you can make demands. You can demand that they train harder, and they do this and that, you can demand whatever you want. “It’s nice that managers put demands on players. Sir Alex [Ferguson] demanded all the time. If a manager doesn’t make demands the players start coming off it and it’s very hard to get it back. Strachan’s early wage packets are dwarfed by the sum being offered to Gordon to return to England. While failing to see a downside had the goalkeeper joined Chelsea, the Scotland manager seems satisfied knowing that Gordon will be playing regularly prior to the vital World Cup qualifier against Slovenia in March. “Who’s to say that he wouldn’t have gone there and [Thibaut] Courtois would get injured and Craig would then be playing in the best league in the world?” he asked. Ron Atkinson, then manager at Sheffield Wednesday, tried to buy Strachan for a second time, having brought him down from Aberdeen to Manchester United. “Are you coming wee man,” he asked Strachan. “Gaffer I’ve been offered this sum at Leeds,” replied the midfielder.